It's not easy making a mobile casino game that looks great on a small screen but still loads quickly and plays smoothly on a smartphone or tablet, but the game designers at Wager Gaming have done it! The new Triple Wild Cherry and Triple 10X Wild slots, now available at Liberty Slots Casino are perfect mix of simplicity and impact. They’re traditional fruitees that look great even on even the smallest screen. Get an up to $200 casino bonus to take the two new mobile casino games for a spin. Until October 15th, Liberty Slots will add a 200% bonus on any purchase of credits up to a maximum bonus of $200. Coupon code: TRIPLE3916. 200% casino bonus available to take new slots for a spin for free. Both games also include win animations that replicate the coins spilling out of the front of the machine, even more thrilling when the game is played wearing 3D glasses. 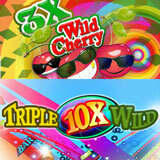 Triple Wild Cherry and Triple 10x Wild are in the download and instant play Flash casinos for desktop and laptop computers as well as the mobile casino for smartphones and tablets.